It warms my heart to feature recipes from the women in my family. I’m so lucky to have piles of tattered recipes from my mother, both grandmothers and even my maternal great- grandmother. I grow nostalgic while gazing at their firm, clear penmanship, recalling times when I was a very small girl in their kitchens. I wish I had more from my Hungarian grandma because she was a superb cook. Unfortunately, she frequently cooked and baked without a written recipe. After a stressful morning dealing with workmen, Larry and I wanted a treat with our afternoon tea. I rifled through a thick and battered folder marked “Family Recipes” and turned to this apricot quick bread. It comes from my maternal grandmother, who I had named “Moo Moo” around my first birthday. You can see her at the top left and right hand sides of this page. She was the most talented home cook I ever knew, even managing her way around a kitchen as she grew blind from glaucoma. As with so many old-fashioned recipes, this one omitted both the baking time and the oven temperature, so I made an educated guess. I wonder if women were just better trained and/or more intuitive in the kitchen years ago? Nowadays it seems that every recipe has to be so carefully written, leaving not the slightest doubt in the reader’s mind what to do next and how to do it! One of my family favorites is a recipe for sticky buns that instructs the baker to “Knead the dough until it fights back!” I doubt that would pass muster for many modern bakers. Other than adding some orange zest, ginger and vanilla, this is Moo Moo’s recipe. For “nut meats” I thought pistachios would be a nice color contrast to the apricots. Because I had a jar of apricot preserves stashed in the fridge, I impulsively added a warm glaze of jam on top of the freshly baked bread. I hope Moo Moo would approve of grandma’s recipe of the month: Apricot Bread. 2. Butter and flour a loaf-sized baking dish. Line the bottom of the dish with parchment paper. 3. 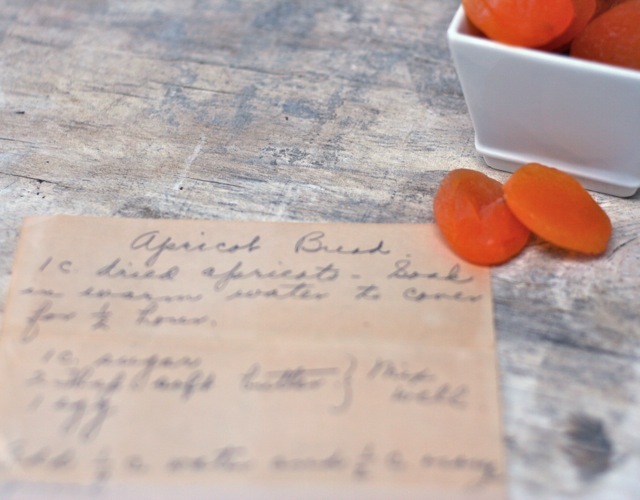 Cut the apricots into quarters and place in a small dish with hot tap water. 4. Using a standing or handheld mixer with a large bowl, combine the egg, sugar, butter, vanilla and ginger. Mix in the orange zest and orange juice. 5. Using a separate bowl, sift together the flour, baking powder, baking soda and salt. 6. With the mixer on low speed, add the flour mixture to the wet ingredients. Mix until just combined. 7. Drain the apricots and add to the batter. Add pistachios and mix briefly. Use a rubber spatula to make sure batter is thoroughly combined. 8. Pour batter into prepared loaf pan. Bake for 40-45 minutes or until cake tester comes out clean. 9. Allow bread to rest in pan for 10-15 minutes before turning out onto a cooling rack. Remove the parchment paper. 10. Gently heat the jam on the stove or in the microwave. Use a pastry brush to glaze the top of the bread. “Knead the dough until it fights back”….I love that! 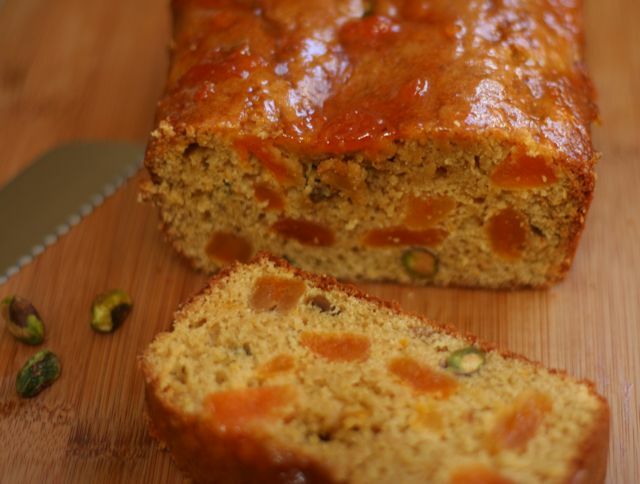 Love the abundance of orange-golden nuggets of apricot in this bread. I’m ready for my tea break NOW! I still haven’t mastered those sticky buns, Steve – would be a fun post . I look forward to the day when I can just bake a treat for an afternoon snack, your recipes at least for now are letting me enjoy a snack. Thanks for sharing. Next time I make it, I will run some over to you both, Toni. I so love your stories and the deeply rooted family traditions that are such a part of your recipes. This bread is beautiful and sounds absolutely delicious. I get many recipes from my Mom who rarely used a written recipe also, it’s always challenging to take the recipes and put them in recipe format with the proper ingredients and amounts. You do it so well, congrats on another great recipe. Thanks, I loved baking from the grandmother’s faded recipe – and thought the glaze added a touch she would have enjoyed as well. Liz I love this recipe! My thoughts are that women were more intuitive back then…and I totally know what you mean about every.single.detail being written out, and if it’s not, it seems that no one can figure out what to do! I made strawberry/banana bread earlier in the week and love apricots. Looks delish! Yes, Averie, I totally agree with you about needing every detail perfectly written out for readers – but so it goes. More more Moomoo, please. Lots of goodies in this one. Cheers to afternoon tea. This looks so lovely. I love the addition of pistachios to the bread. How fortunate you are to have access to those recipes. As a first generation Vietnamese American, my parents brought me here with nothing in their packs. I rely on my mother’s memory to retrieve family recipes. You remind me that I need to start journaling them all. Yes, even if you can get your Mom to speak and you tape them. I’m still upset that I let my aunt’s house go without saving her recipe file. I love your background story about Moo-Moo. You created such a strong image of her in the kitchen. You’re so lucky to have these memories, and all these great recipes!! I just found my Njanja’s handwritten cookbook that I thought I threw away a long time ago (she had some awesome handwriting!). And you are so right, the recipes are more like reminders, as these women knew what they were doing and did not need to put the size of the pan, temperature of the oven, nor the duration of baking time:) But they were masters in their kitchens! I know that my girls would love this cake (they are apricot fiends) and I will definitely try it:) Going to pin it right now, not to forget! (I am trying to comment, but it wants me to log into my WP account first, which is weird; I left comments on your site before with no problems:) I’ll keep on trying! You are indeed very lucky to have so many family recipes, how wonderful! This bread looks wonderful! The bread looks beautiful and I love the story behind it, Liz.